A walk through Kiev City shows the old and the new nestling comfortably alongside each other—historic old buildings next to modern stores along busy streets. It’s easy to travel around the city; the Kiev Metro carries two million passengers to 46 stations across the city every day. Shopaholics may find Kiev’s historic areas, such as the Andriyivsky Descent, attractive as they are popular haunts of street vendors selling everything from Ukrainian art to religious items, from clothing to books, from chess sets to jewellery. Ukraine’s independence in the early 1990s brought a host of changes to Kiev, including top-class residential complexes, luxurious hotels, nightclubs and classy restaurants. Many buildings have been restored and redecorated, especially on Khreschatyk Street and near Independence Square. 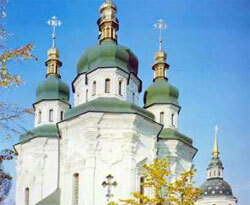 Nothing beats the prime neighbourhood of Khreschatyk, the centre of life and activity in Kiev, on Kiev’s main street. From the Slavic word khrest, meaning “cross”, it is situated in a valley crossed by several ravines and does resemble a cross when viewed from above. The more expensive properties are located in the Pecherskyi and Khreschatyk areas, while prestigious new buildings can be found in Kharkivskyi and Obolonskyi along the Dnieper River.